Orbital geometry of LS 5039, where a compact object - presumable a black hole - is in a tight orbit around a massive star (Casares et al. 2005). The system is viewed from above. Orbit geometry and the 3.906 day orbital period are derived from radial velocity measurements. 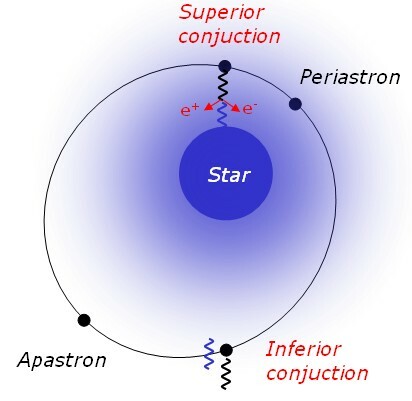 Indicated are the points of closest approach of the compact object (Periastron), with a separation of about 2 stellar radii, and the most distant point on the orbit (Apastron), as well as the superior and inferior conjunction, where the objects line up along the line of sight towards the observer. The orbit plane must actually be somewhat inclined since X-ray emission from the compact object is not eclipsed by the star. One year ago, in August 2005, the microquasar LS 5039 (top figure) was featured as source of the month. Novel exciting results on this source merit a renewed discussion, despite the many other H.E.S.S. sources which await presentation. LS 5039 was the first microquasar established as a high-energy gamma-ray source (Aharonian et al. 2005), more recently followed by LS I +61 303 (Albert et al. 2006) as a second example. Such binary systems with eccentric orbits provide a unique laboratory to study how particle acceleration and propagation vary with the changing environment along the orbit. 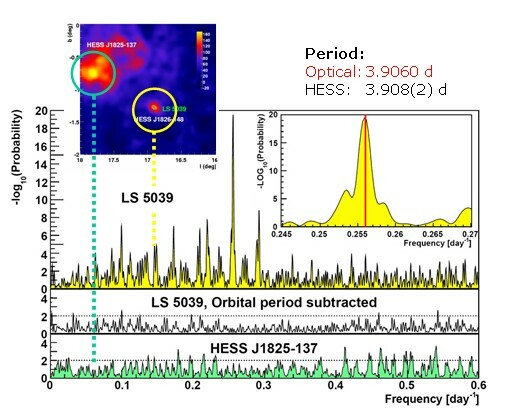 Orbital X-ray variability of LS 5039 was indeed reported byBosch-Ramon et al. (2005). Variation of high-energy gamma-ray emission from binaries has been observed on sections of the 3.4-year orbit of the binary pulsar PSR B1259-63/SS 2883 by H.E.S.S. (April 2005) and along the 26 day orbit of LS I +61 303 by MAGIC (Albert et al. 2006). With its 3.9 day orbit, LS 5039 now allows for the first time recording many periods and establishing periodic variation of the gamma-ray flux along the orbit. 3.9 day orbital modulation in the TeV gamma-ray flux and spectrum from the X-ray binary LS 5039, H.E.S.S. 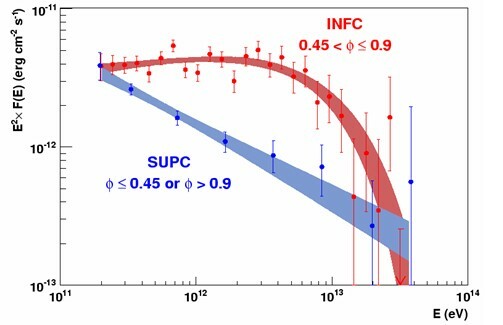 collaboration, F. Aharonian et al., astro-ph/0607192 (2006). Fig. 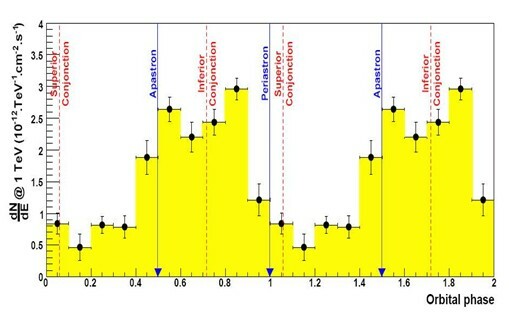 1: Periodogram of the gamma-ray emission from LS 5039 (yellow), where the intensity of flux modulation at a given frequency is expressed in terms of the probability that this intensity results from random fluctuations of the measured flux. The peak at an orbital period of 3.908(2) days is highly significant, and the frequency of the peak agrees well with the orbital frequency of 3.906 days. The other peaks in the periodogram result from beats between the orbital frequency and semi-periodic gaps in the data, such as full moon periods. These additional peaks disappear when a sine wave with the fundamental frequency is subtracted from the measured gamma-ray rates before calculating the periodogram (middle diagram). The source HESS J1825-137, located in the same field of view and observed at the same time, shows no modulation (green); its periodogram is consistent with statistical fluctuations in the gamma-ray rate. Fig. 2: Gamma-ray rate as a function of orbital phase, averaged over many orbital periods. The rate is repeated for two orbits. The maximum emission is centered around the inferior conjunction (see top figure). Fig. 3: Spectral energy distribution of gamma rays in the orbit sections with high gamma ray flux, around the inferior conjunction (red), and with low flux, around the superior conjunction (blue) .